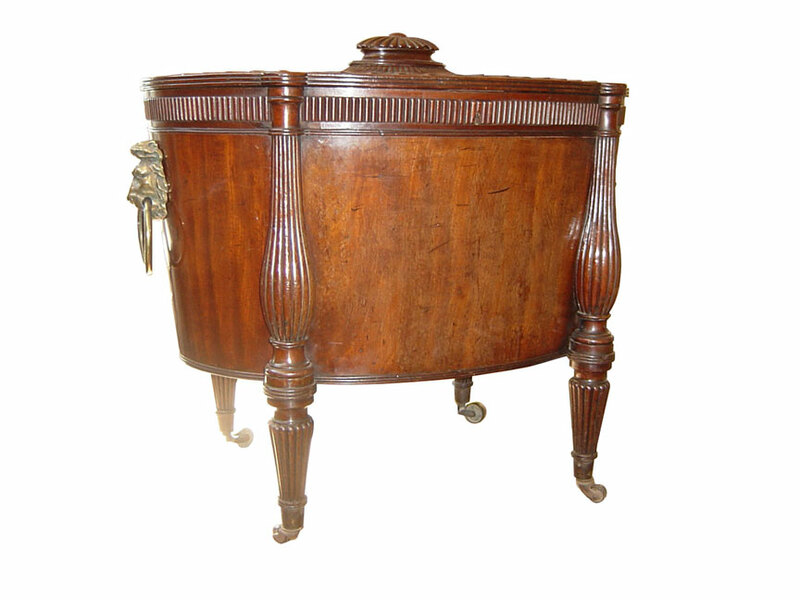 A. W. Firth Antique Restorations, Antique Clocks & Barometer sales, Glossop, Derbyshire. This website was last updated 22nd-October-2018. A W Firth Restorations, are a small, independent, antique clock/barometer and furniture restorers based in Hadfield, Derbyshire. We specialize in and carry out all our own antique clock restorations to movements, clock cases, cabinet restoration, silver & painted dials, and many other types of general repairs. 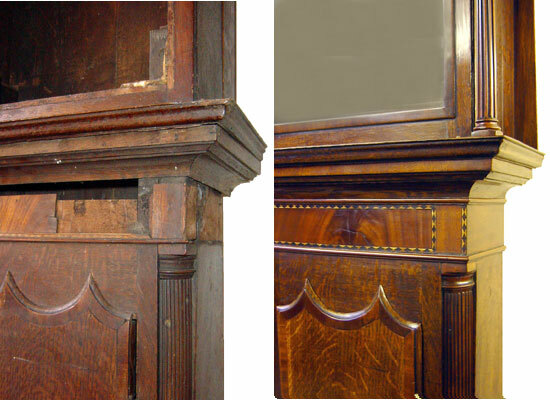 Many of the Restoration Products used on a regular basis in our own workshop we manufacture ourselves. 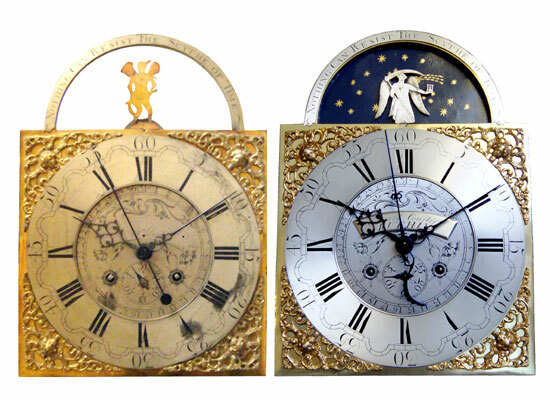 All are available along with over 47 different sizes and designs of Steel and Brass Clock Hands for Long case, Bracket & Dial Clocks etc, and over 150 various Tools, Keys and Accessories, all of which you will be able to purchase directly on the following website www.awf-clocks.co.uk/ . To make a special enquiery regarding clock hands or any order: please email Andrew directly with all the relevant details & any pictures, along with your Name and Tel contact details to, afirth7@yahoo.co.uk or for all general enquiries please contact one of the following Tel Nos, 07967557651 or 07920841377 if you prefer, you can also find us and place an order on eBay at awf- clocks click "Items for sale" and you will also see our latest items. For Barometers we also supply New Syphon tubes for wheel Barometers along with Guide Tubes, floats & counterweights + many other Barometer parts and Accessories such as most Tubes, for Stick type Barometers, Mercury & Spirit Thermometers in almost any size, Architectural and Swan Neck Tops etc, again for all enquiries please use any of the contact methods above. We also have a range of splendid items for sale including Longcase (Grandfather) clocks, Wall clocks, American, Bracket clocks, to name but a few, and also Barometers Please see the "Inventory List" on the left. If what you are looking for is not listed please contact us as we may be currently restoring an item similar to your requirements or otherwise be able to help you. Whilst your here, take a look at the picture gallery on the before and after page, hopefully you will then have a better idea of what we are capable off, we also like to think that nothing is beyond hope, our experience with furniture restoration can also be seen here with the furniture and wall panelling restoration carried out for & on behalf of the Royal Lancashire Fusiliers Bury Lancashire. Using the calendar below you will now be able to set your moon phase dial to the correct position appropriate for where you live, don't forget depending on where you do live in the world to make the alteration, Northern or Southern Hemisphere (you can also find out what phase the moon was the day that you were born). A very good friend of mine Ben Naylor is the proprietor of Jack Badger Joinery, Glossop, which was formed in 2009, since then, they have carried out many prestigious aspects of work which can be seen here, Jack Badger Carpentry and Masonry, have a browse, I can assure you, you will not be disappointed. Frances England also a very good friend of ours for some time now, and has a small cottage industry by the name of England's Magic we thought you might like to be introduced to this fascinating workmanship, it really is quite magical take a look and see for yourself.